Spencer grew up on a farm near Sumner, IA and is a recent graduate of Iowa State University (ISU) with a degree in Agricultural Engineering. 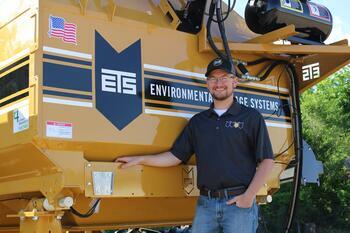 "He brings us many positive experiences that will contribute to his success at ETS. Most recently, Spencer worked for the Agricultural and Biosystems Engineering (ABE) Department at ISU as an Agriculture Engineering Research Assistant. He built test equipment and collected data to study soil compaction testing in conjunction with Firestone Tire," says Senior Design Engineer Scott Opsahl.